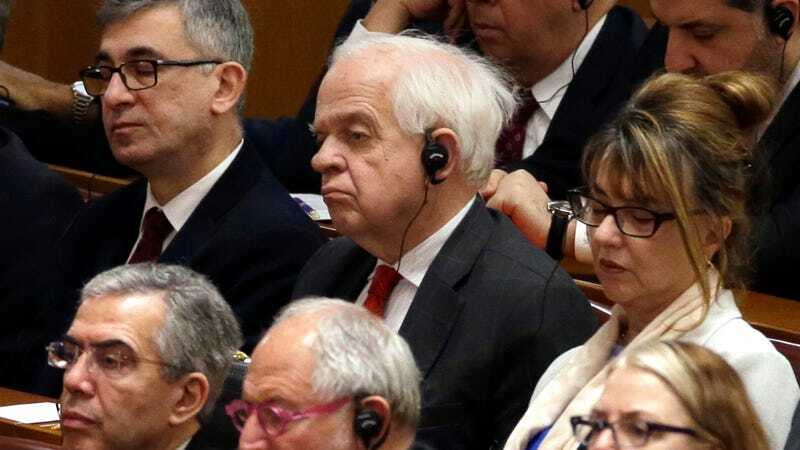 John McCallum, center, seen here at the 40th anniversary of China’s Reform and Opening Up policy at the Great Hall of the People in Beijing in December 2018. Canadian Prime Minister Justin Trudeau has fired the country’s ambassador to China, John McCallum, for saying that the detained chief financial officer of Chinese tech giant Huawei could make a strong case to avoid extradition to the U.S.—and that perhaps it would be really good if Canada just backed down on the matter, the Guardian reported on Saturday. Meng Wanzhou, the executive in question and the daughter of Huawei’s founder Ren Zhengfei, was detained in Canada in late 2018 at the behest of U.S. authorities who accuse her of overseeing a labyrinthine scheme to evade nuclear sanctions imposed on Iran. The incident has greatly damaged relations between Canada and China, which has characterized the ongoing court battles over Meng as an abuse of power. Canadian authorities have been moving the case forward as the Jan. 30 deadline for the U.S. to formally request Meng’s extradition looms. But as the New York Times noted, Trudeau’s government is under great pressure not to politicize the case, and McCallum’s remarks “stunned seasoned diplomatic observers.” The case may affect the fates of three Canadians currently in Chinese custody, two of whom were detained on the vague grounds of “endangering national security” and another sentenced to death for alleged drug smuggling, the Times wrote. A former member of Parliament, McCallum had also previously had top-level jobs as the minister of defense, veterans affairs, national revenue, and immigration, refugees, and citizenship. According to the BBC, his wife is ethnically Chinese and “he had a large Chinese-Canadian population in his former constituency in Ontario,” factors which drove his original interest in the ambassadorship. McCallum “really made it untenable for the prime minister to sustain him [in his post] for any length of time and he had to go,” Brock University professor and former diplomat Charles Burton told the Guardian. Meng was granted bail in December 2018, though under conditions including a strict curfew, ankle GPS monitoring bracelet, and hiring a 24/7 security team at her Vancouver residence. The BBC wrote that the Chinese government is still lobbying to have the extradition request withdrawn, though the U.S. shows no sign of backing down. Chinese officials have also denied that the fate of the three Canadians is tied to the diplomatic showdown, the BBC added. Huawei faces other problems in the U.S., which is still in the middle of a trade war with China. Those include reports that the Department of Justice is preparing for a criminal case against the company over alleged trade theft and continued accusations (albeit without hard evidence) it could be spying on behalf of the Chinese military or intelligence agencies. Ren has publicly denied the espionage accusations, though the U.S. and several of its allies have imposed restrictions on its ability to do business, particularly in the field of telecommunications gear.